The Calcutta Garamond – Its a Nerd’s Life! 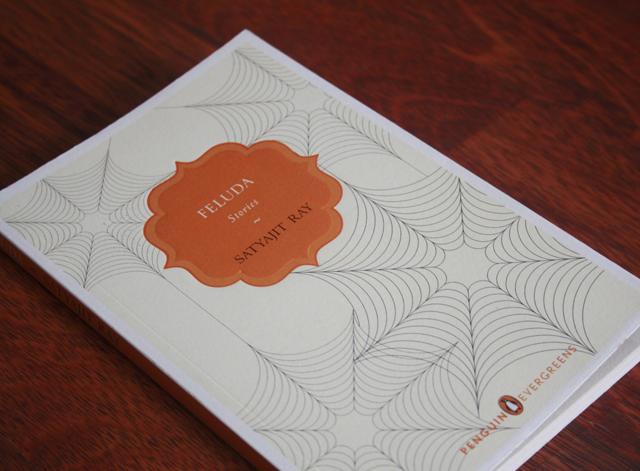 A couple of days ago I picked up a copy of Satyajit Ray’s Feluda stories (an English translation by Gopa Majumdar). The book has four stories – Kailash Choudharyr Pathar (Kailash Chowdhury’s Jewel), Samaddarer Chabi (The Key), Sheyal Debota Rahasya (The Anubis Mystery) and Golokdham Rahasya (The Mysterious Tenant). In the last of these four stories, Golokdham Rahasya, Feluda solves the mystery of a theft and murder by looking at the typeface on an envelope. Now, this had to get me excited! And for huge fans of Feluda, there is a great interview with animator and concept artist, Sukanto Debnath, who is working on the character design for Feluda’s The Kathmandu Caper (to be broadcast by the Disney Channel in India soon) at the blog down at Rarh Magazine. I took up on Shubho’s reference about Satyajit Ray’s first Feluda story, and picked up a big, fat collection at Blossom’s last afternoon. I read the first Feluda story Danger in Darjeeling (called Feludar Goendagiri in Bengali) on my flight back to Delhi, and found the passage that Shubho recalls in his comment. ‘Look at the letter in your hand. Take the various printed words. Do they tell anything? ‘Feluda thought for a few seconds. ‘The words were cut out with a blade, not scissors’, he said. Yes. I agree with Eshan. This is really cool! Wow. You should read all Feluda stories. thanks pooja for sharing this,. It takes a genius like Satyajit Ray to come up with such a meticulous observation about typefaces, and that too as a part of a detective story. Once I was too summoned to the police station to verify a fraudulent letterhead which used arial (and not frutiger). My pleasure! 🙂 The story from the police station sounds interesting – maybe fodder for your blog? Why isn’t this just brilliant! Thanks for sharing. Need to go buy! Thanks for the references, Shubho!